Lonely Planet Cycling Italy - this is one of only two books in English that cover the whole of Italy. There are 38 rides in the book, generally 3-4 days long. The coverage is mainly focused on northern Italy and Tuscany but there are some rides in the South, Sicily and Sardinia. The routes themselves seem well chosen ranging from very demanding to easy - so as they say there's something for everyone. The book also includes a lot of material from the general Lonely Planet guide including recom­mend­a­tions on accom­mod­ation - which may be an advantage or a disad­vantage depending on whether you already have the general Lonely Planet guide. Italy by Bike (Touring Club Italiano). Contains 105 rides from the Alps to Italy but these are mainly day-rides. Cycling Atlas Tuscany (Cycline). A good selection of routes - which can be linked together - with good clear mapping. Ediciclo editore are a small publishing house special­ising in cycling guides. These include a number of guides to the long-distance routes which may be of interest to inter­na­tional travellers. Good, clear mapping in a spiral bound format. They also includes addresses of tourist inform­ation offices and bike shops - so they may be of interest even if you don't speak Italian. The maps you are most likely to find in Italy are the 1:200k and 1:400k maps produced by Touring Editore (the Touring Club Italiano). The 1:400k maps cover the whole country in three sheets and provide a good overview, however, the 1:200k maps are probably the best compromise between weight and detail. The maps are printed on plastic sheets which are both very hardwearing, light, and water­proof. 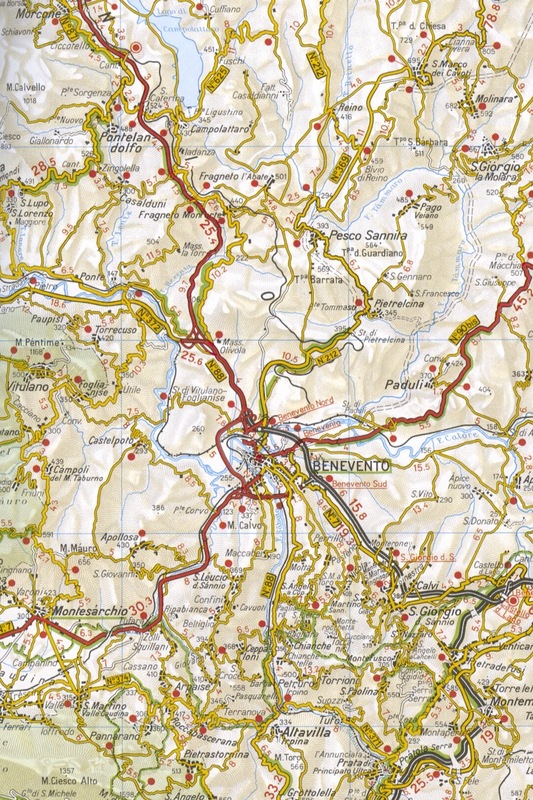 The format is very similar to the equivalent Michelin maps: eg it gives eleva­tions of passes and other places en route; the steeper roads are indicated by one or more chevrons pointing in the direction of the climb; scenic roads are highlighted in green. While these are the most commonly available it's often the case that bookshops will have every map except the map for the region you are in - which is probably the one you're looking for. So it's probably worth getting some before you travel. I find the Touring Editore maps easier to read than other brands - mainly because the other brands tend to de-emphasise the minor back roads that are of often of most interest to cyclists. Touring Editore also produce a 1:200,000 Atlante (Atlas) covering the whole of Italy. It's very compet­it­ively-priced and useful for reference but personally I prefer the sheet maps for route planning. Update: it looks like the 1:200,000 road atlas is now out of print and has been replaced by a 1:225,000 road atlas. There's also a a 1:500,000 Atlante Stradale Tascabile. Tascabile means 'pocketable', but at a little over A5 (23cms x 15cms) and weighing in at over 400 grams it's not that pocketable. It's still a convenient format for tour planning and reasonably priced. The mapping is the 1:400,000 mapping reduced by 25 percent which means that some of the detail really gets pretty tiny, but on the other hand it's easier to find your way around than its bigger sibling. There are other brands of maps at similar scales especially from Michelin, but I find that these often tend to de-emphasise the minor roads that can be of most interest to cyclists. Here are a couple of screen­shots to show what I mean. (Note I haven't adjusted the colours or contrast - the Michelin map is, let's say, a lot more under­stated). These things are a matter of personal preference, the TCI map is very busy, but for me it's more useful than the altern­atives. If you're planning to cycle in the Dolomites then I'd recommend the 1:200,000 Dolomites road and Panoramic Map from local publisher Tabacco. 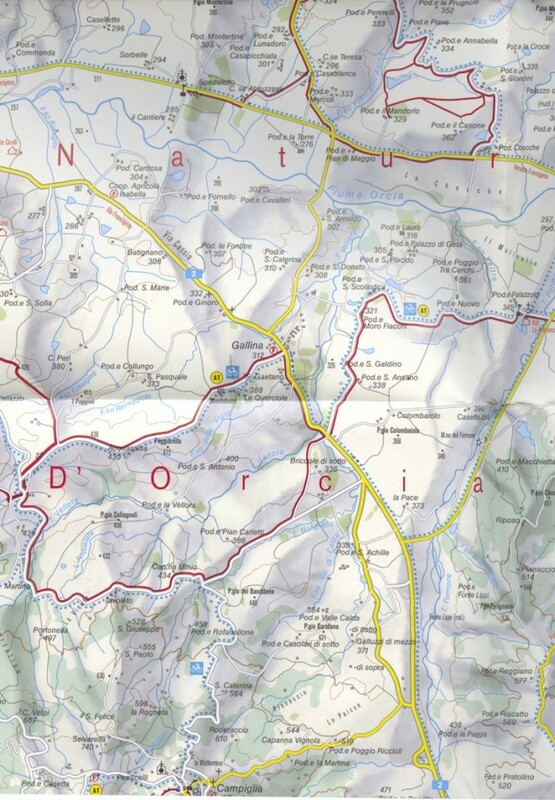 The panoramic map is partic­u­larly useful for route planning and helping you work out which mountain is which. The road map suffers from the same issues as the Michelin maps, but it does indicate the location of campsites. Tabacco also produce a 1:100,000 map of Friuli-Venezia-Giulia. This is gives you the advantages of a map showing contours while still covering a reasonably large area. If you follow the link to Amazon, don't be put off by the very poor-quality scans on Amazon. If you're looking for more detailed maps then the major publisher is Kompass. They produce a range of 1:50,000 and 1:25,000 maps. Their range covers large parts of northern and central Italy including the Alps and Dolomites, as and large parts of Toscana, Umbria and Emilia-Romagna. the Kompass maps are widely available. You can download a coverage map from their downloads page NB you need the map of the Carte Escursionistiche/​Wanderkarten not the cycling maps. These maps are widely available in the areas covered. Here's a sample of a Kompass map. They include cycling routes (although the newer maps don't distin­guish between MTB and road-bike routes) as well as campsites. Newer maps also include a grid so that they can be used with a gps. Cycling routes are marked on these maps. However one point to bear in mind is that while these are some of the best maps available for Italy, they don't always reliably distin­guish between surfaced and unsur­faced roads. The maps are being updated to include gps-compatible grids, but many of the older maps that you are likely to find in the shops don't have any sort of a grid. There are other publishing houses special­ising in areas of Italy: for example Tabacco specialise in the Veneto. Some of the national and regional parks have also commis­sioned 1: 50,000 maps for hikers and mountain­bikers. Tappeiner specialises in the Südtirol. 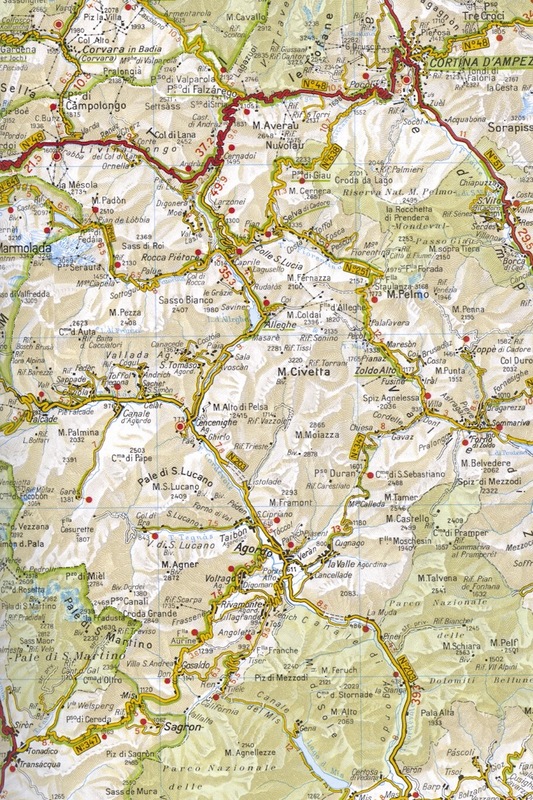 If you're cycling planning on cycling in the dolomites then you might find their panoramic map extremely useful. 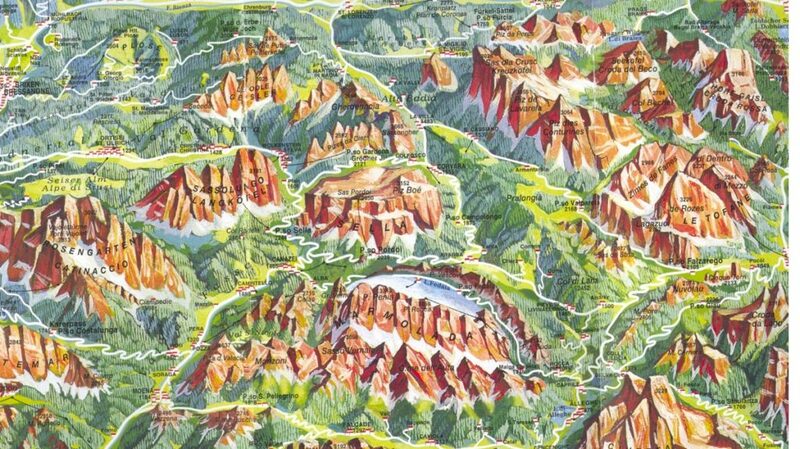 A number of regional and national parks also publish maps for their areas so it's worth checking with the park inform­ation offices. The Kompass and Tabacco maps are widely available in the areas they cover. TCI maps can be more difficult to come by and in my exper­ience, bookshops tend to out of stock of the maps of their local area. The best bet is probably to buy maps from Amazon Italia. Postage within Europe is 7€, but if you only need to order 2 or 3 maps to save this compared to the costs of buying from local suppliers. In the past I have relied on Garmin's City Navigator Europe and its Italy Topo maps. 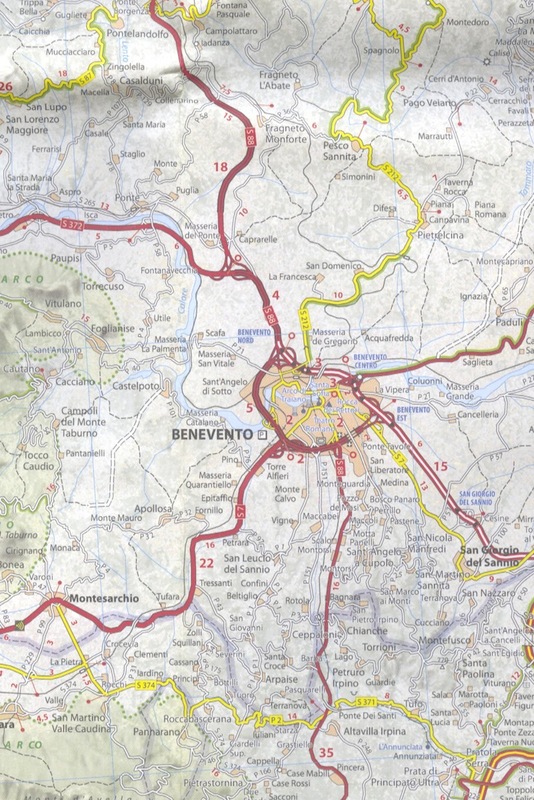 I've been generally pretty happy with them but, open source mapping is increas­ingly becoming a viable altern­ative: I've been very impressed with the mapping from velomap.org and I am currently using their openmtb map of Italy. Couple this with Garmin's mad, restrictive licensing policy (they prevent you from trans­ferring your maps if you buy a new gps) and Open Street Map/​Open Cycle Map start to look like a no-brainer - but I'd download and check the mapping for the area you are planning to visit before you set off. When it comes to digital mapping, I used to use Garmin City Navigator and topographic mapping which I've found extremely useful and generally pretty accurate. However, I have now switched over to the OpenStreetMap maps: there is a large and active community of OpenStreetMap contrib­utors in Italy so the detail and accuracy is impressive. The OSM maps also show many of the Bicitalia and other cycle routes. I have noticed that in parts of southern Italy the Garmin maps may still have the edge but otherwise the OSM maps are at least as good and have the big advantage of being free. You can also get versions of the OpenStreetMap maps with contours. These are a huge help in helping to assess altern­ative routes and giving an idea of the ups and downs on the road ahead. You can control the amount of detail displayed by the device so you can increase the detail when you want to display the contour lines and decrease it when you don't need them. I use the maps from the VeloMap/​OpenMTB project, but there's also openfietsmap.nl that are equally good. Both offer maps in the .img format which means you can copy the maps to your Garmin device. Alternatively you can also use them with Garmin Basecamp (free).